Ammon Bundy (from left), Ryan Payne and Ryan Bundy on the day a mistrial was declared last month. They were joined by Jeanette Finicum, widow of Robert "LaVoy" Finicum, and Ryan's wife and daughter. From left: Nevada rancher Cliven Bundy, his sons Ammon and Ryan, and Ryan Payne. The courtroom drama comes more than three years after a tense confrontation unfolded in a different venue — the Nevada desert. Cliven Bundy has refused to recognize the government's control over U.S. public lands since the 1990s, racking up roughly $1 million in unpaid grazing lease fees and fines. In April 2014, federal agents demanded Bundy remove his cattle from those public lands — only to be met with a group of Bundy's armed followers, including his sons Ammon and Ryan and a man named Ryan Payne. A weekslong standoff ensued, ending only when the federal government backed down — though the men were arrested nearly two years later. "Ammon and Ryan Bundy, along with several other codefendants, were acquitted last year on similar — but separate — charges for their role in the 2016 armed occupation of Oregon's Malheur National Wildlife Refuge. While two of their fellow occupiers were later convicted on federal conspiracy charges, the brothers Bundy had successfully argued that they were simply exercising their First and Second Amendment rights during that 41-day standoff. 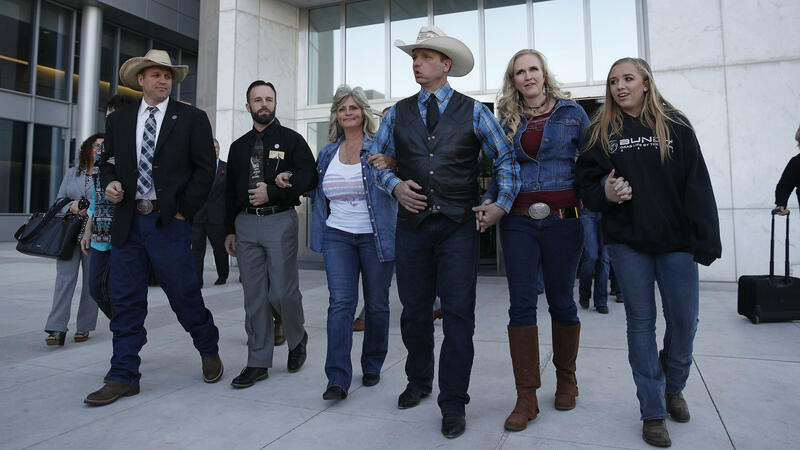 "They remained on the hook for charges related to the 2014 Nevada standoff — though prosecutors there experienced several starts and stops of their own even before [a mistrial was declared]." Of the six other men who faced a trial for their role in the 2014 confrontation, only two were convicted of some charges — and none of them was convicted of conspiracy. Monday's ruling proved the coup de grace, capping the series of legal stumbles and inspiring concerns from officials in the region. Specifically, many current and retired federal land managers worry the failure to prosecute Bundy could jeopardize the safety of federal field workers in the West. For the Bundys, however, the moment marked a significant victory. They left the courthouse after the ruling bearing smiles and vows to continue fighting what they see as federal overreach. "I want to say this: We have rights," Ammon Bundy told reporters, with a Bible tucked in one armpit. "We're not going to walk away from them and just let them be taken." There's been an extraordinary decision from a federal court in Nevada today that could affect the way the federal government manages millions of acres of public lands. A judge has dismissed conspiracy and assault charges against rancher Cliven Bundy, two of his sons and another militiaman. These charges came from their role in a tense armed standoff against federal agents over cattle grazing on public lands back in 2014. The judge cited what she said was serious misconduct by federal prosecutors. NPR's Kirk Siegler joins us now with more. Hi, Kirk. KIRK SIEGLER, BYLINE: Hello, Ari. SHAPIRO: First remind us who Cliven Bundy is and what he and these others were accused of. SIEGLER: Well, this ruling is the culmination of a staredown between Bundy and the U.S. government that's been going back since really the Clinton administration, if not before. Like a lot of ranchers in the West, Cliven Bundy doesn't own much of the land himself. He has to lease public land from the U.S. government to graze his cows. He just says that the government has no right to control that land. And so he's refused to pay grazing fees that every rancher has to pay and defied court orders to remove his cows from the land. So this all came to a head when the government finally moved in to round up the cows and they were met by the armed Bundy militia. Bundy wasn't actually arrested until almost two years later. And today when all the charges were dropped against him, he told reporters outside the courtroom - a free man - he said he had been a political prisoner. Let's listen in. CLIVEN BUNDY: We're not done with this. If the federal government comes after us again, we will definitely tell them the truth. And that's all we've ever tried to do, is tell them the truth. SHAPIRO: Kirk, explain why the judge threw this out. At first it had seemed like a pretty clear-cut case with videos showing the militia shutting down an interstate and pointing guns at federal agents. SIEGLER: Right. Well, she cited what she called flagrant misconduct by the prosecutors. This all surrounds revelations that the prosecutors failed to disclose footage from an FBI surveillance camera at the standoff, the fact that there were FBI snipers trained on Bundy and that the government had a document that said the Bundy family themselves weren't violent. Prosecutors had responded not successfully that they had turned over thousands and thousands of pages of audio and video recordings. But that didn't pass muster of the judge. SHAPIRO: Is this it, or can the government appeal? SIEGLER: They can appeal this. But I think you have to consider the politics here. That's very unlikely. It was of course the Obama administration that brought the case against Bundy. Until recently, there hasn't even been a U.S. attorney in Nevada. The attorney that brought the case resigned when Trump took office. And then, you know, Attorney General Sessions was in Las Vegas recently, and he said that he could see both sides of this story. So, Ari, there's not really an indication that the Trump administration is considering going after Bundy to be - and his militia, for that matter - to be a big priority. SHAPIRO: I said at the beginning of this conversation that this decision could affect the way the federal government manages millions of acres of public lands. Tell us about that. SIEGLER: Well, there are a lot of questions right now. You know, what does this mean for other ranchers? Could they just stop paying grazing fees on public land and ignore the rules like Bundy did? And, you know, I did get a statement just recently from Trump's interior secretary, Ryan Zinke, that he said, you know, they're going to take a more neighborly approach to rural Americans to cool some of the tensions going forward. But I think there is a concern among federal employees I talked to and people who work out on the land that this ruling and the freeing of Cliven Bundy could lead to more armed standoffs in the West. SHAPIRO: NPR's Kirk Siegler, thanks a lot. SIEGLER: Glad to be here. Transcript provided by NPR, Copyright NPR.